In Chris Brown's Big Year, Tough Questions On Abuse The R&B singer is back only a few years after pleading guilty to felony assault for beating former girlfriend Rihanna. Views on the issue he brought to the forefront haven't changed much: Many teens find Rihanna at fault. But they're at a high risk of experiencing domestic abuse themselves. 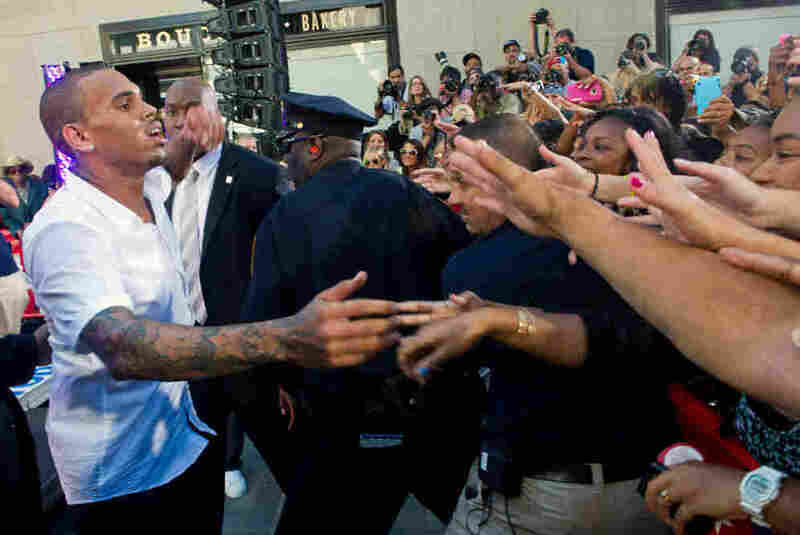 R&B singer Chris Brown is back only a few years after what could have been a career-ending incident. In 2009, just before that year's Grammy Awards show, Brown violently beat his superstar girlfriend Rihanna. He was 19. Brown later pleaded guilty to felony assault and was sentenced to five years of labor-intensive probation and a year of domestic violence prevention classes. Close to 50 percent of the young people we surveyed thought that Rihanna was actually responsible for the incident. Then he virtually disappeared from Top 40 radio, after being a staple there since his 2005 breakout hit, "Run It." After what many simply refer to as "the incident," Brown struggled to regain his footing. He released an album that didn't sell, record stores stopped promoting his material, and pop radio, at least for a while, wanted nothing to do with him. But fast-forward to 2011, when he may have just had his best year ever, at least musically. Keith Caulfield, a chart expert at Billboard, says Brown has had a banner year. "Chris Brown got his first No. 1 album on the Billboard 200 chart this year," Caulfied says. He notes that Brown has been a force on both the Billboard Hot 100 singles chart, as well the R&B hip-hop singles chart, where he's had five top 10s in the past year. In spite of this success, a cloud still hovers over Brown's career. While it has had quite the turnaround, views on an issue that he brought to the forefront two years ago haven't changed much. Just after he beat Rihanna in 2009, the Boston Public Health Commission's Start Strong Initiative polled teens in Boston to see how they felt about the incident. "Close to 50 percent of the young people we surveyed thought that Rihanna was actually responsible for the incident," says Casey Corcoran, the former director of Start Strong who led the poll. "They were blaming her." And more than two years later, they still are. 1 in 3 adolescent girls is a victim of physical, emotional or verbal abuse from a dating partner. In a survey of 7th-graders in a high-risk community, more than 1 in 3 boys and 1 in 4 girls reported being a victim of dating violence in the past year. 1 in 3 teens report knowing a friend or peer who has been hit, punched, kicked, slapped or physically hurt by a partner. 1 in 3 adolescent girls in the U.S. is a victim of physical, emotional or verbal abuse from a dating partner. Outside of a Chris Brown concert in Baltimore this past fall, almost a dozen teens interviewed still held some troubling views about "the incident." "Obviously she played a part in getting beat, or whatever," said 19-year-old Kristina Coleman. "However you want to put it." And she wasn't alone in her opinion. Several other teenagers in the crowd outside 1st Mariner Arena made similar remarks, forgiving Brown and blaming Rihanna, but they were too young to be named or quoted in this story. Two things make these young women's views surprising. First, Brown has apologized for the incident, denouncing his behavior on national television and in a widely viewed YouTube video. "What I did was unacceptable, 100 percent," Brown said in that video. "I can only ask and pray that you forgive me, please. I hope that others learn from my mistake. I intend to live my life so that I am truly worthy of the term 'role model.' "
Secondly, many of these young women are at a high risk of experiencing domestic abuse themselves. "We know that nationally, close to 1 in 5 teens experience some form of dating violence before they exit their teen years," said Corcoran. That number's even higher if you count things like emotional abuse and cyberstalking, Corcoran says. Information provided by the Family Violence Prevention Fund, which has since changed its name to Futures Without Violence, says the violence starts young. One online survey cited by the group found that 1 in 5 "tweens" (children between the ages of 11 and 14) say their friends are victims of dating violence. But outside of that Chris Brown concert, these things weren't on fans' minds. Alicia Robinson, 17, was among the fans who go beyond just forgiving Brown and blaming Rihanna. "He's kind of what we would like our boyfriends to model after, in a way," Robinson said. Corcoran says some of Brown's current songs aren't exactly role-model material. "While he hasn't been involved in any dating violence incidents since this one with Rihanna, he's put out a number of songs that have really challenging lyrics," Corcoran says. "He may have addressed his behaviors, but we have to question whether he's really addressed his thoughts and beliefs that underlie those behaviors." The teens Corcoran works with make a list each year of the 10 songs that most promote unhealthy young relationships. Brown made that list in 2010 with his comeback single, "Deuces." He may make it again with his biggest 2011 hit, "Look at Me Now," which features several graphic and sexually explicit lyrics. Many other songs on his album touch on the same themes. We don't have conversations with girls about violence ... I think the only message that young girls get consistently about relationships is don't get pregnant, don't get pregnant, don't get pregnant. Gina McCauley, who writes the blog What About Our Daughters, says Brown may be benefiting from a certain mindset that's prevalent in the black community. She thinks black men can get away with almost anything; but black women? "We always blame black women when something goes wrong," McCauley says. "And we hold them to a completely different standard than we hold black men and boys to. And so while Chris Brown isn't responsible for any actions, at his own hands, the girl — in this case, Rihanna — is always held responsible. And it doesn't matter if she's a poor black girl in the middle of the hood, or one of the most famous and probably commercially successful artists on the planet. She's still a black girl, and she's still responsible for every single thing that may happen to her in life." And so, she says, young black women tell themselves they're invincible, in spite of the data on domestic abuse. It's a bit of a contradiction — or, to McCauley, a coping mechanism. If they admit that a young black woman like Rihanna at the top of her game can be abused, they have to admit it can happen to them. "To not blame Rihanna is to acknowledge that they, as young girls, are vulnerable too," she says. 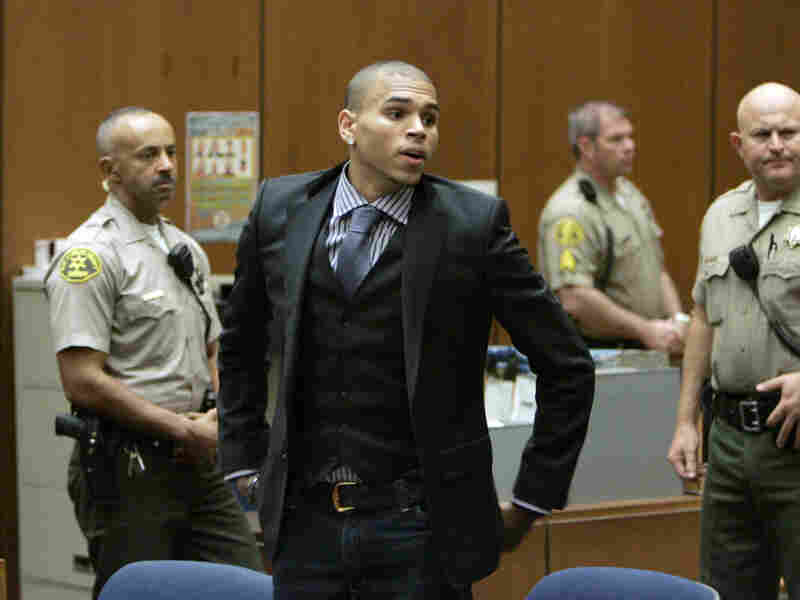 Chris Brown prepares to leave court after a hearing in Los Angeles in November 2009, to offer a judge his first progress report since being sentenced for beating ex-girlfriend Rihanna earlier that year. McCauley says admitting they're at risk would shatter the myth of the strong black woman that so many of these girls have come to internalize. But, McCauley says, it's not all their fault. "We don't have conversations with girls about violence," she says. "We don't say, 'How do you navigate interpersonal relationships with boys?' I think the only message that young girls get consistently about relationships is don't get pregnant, don't get pregnant, don't get pregnant." For her part, Rihanna, in a recent Esquire interview, said she's a Chris Brown fan and has put the incident behind her. And Brown, as well as his team, no longer speak about the incident. He declined to be interviewed for this story. McCauley says she isn't surprised that neither Brown nor Rihanna have made more of an effort to change the dialogue about domestic abuse among teens and tweens. "I don't expect celebrities to be anything but what they are, which is famous," she says. Brown's recent success proves he's having no problem doing just that. And for his young fans, that seems to be enough for now.